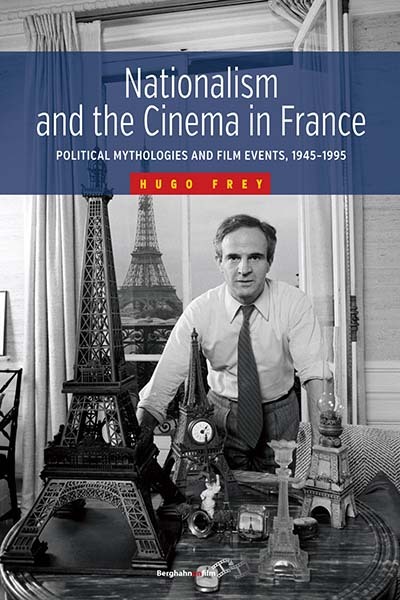 Fifty years of French cinema get their close-up in Hugo Frey’s Nationalism and the Cinema in France: Political Mythologies and Film Events, 1945-1995, published in July. Following, the author offers readers a new angle on the volume, which is itself a fresh perspective on French film against a nationalistic backdrop. Why did you write this book? What were your original aims? The motivations for undertaking this research are complicated and now date from some time ago. Having written a study of the director Louis Malle (2004), I wanted to continue to develop my knowledge of French cinema, while still connecting to my other interests in national historiography and the collective memory of the Vichy period. However, I did not want to work on a conventional book about either ‘great French films of recent times’ or indeed something that just rehashed familiar debates already presented in titles such as Henry Rousso’s The Vichy Syndrome. It was also the case that several people encouraged me to write something about French cinema and its cultural setting. However, I think they wanted a title that introduced and surveyed the intrinsic qualities of French cinema – probably in a title with lots of illustrations. The book I was thinking of was quite the opposite: I wanted to describe and analyse how film was a vector for a nationalist politics; the discourses of inclusion and exclusion that matter. As for illustrations, my title has only two – the Truffaut cover shot, which I hope captures some of the themes, and an infamous press photograph of Alain Delon with Jean-Marie Le Pen. The other underlying influence to do this long work was the remarkable thinking on culture and discourse, structures of understanding the circulation and communication of political ideas, developed by people like Jean-Pierre Faye, John B. Thompson, as well as my own former doctoral supervisor in the 1990s, Chris Flood. For this reason making some kind of plausible ‘total picture’ of the nexus of cinema and nationalism was at one point a very attractive ambition. However, there is a difficult tension between writing an original thematic history of film and claiming the bigger picture. I have no idea if that difficulty is resolved in the finished work. In any case, the book is a thematic study and each chapter represents what I identify as a primary discursive space where film and nationalism are powerful ingredients. Time is therefore devoted to: cultural elitism, historical mythologies, chic modernism, neo-colonialism, anti-Semitism, and anti-Americanism. Why do you think, generally speaking, people do not very often address the nationalism of French cinema? To be fair, it is often a theme in more general works and there have been exceptionally important contributions from Susan Hayward, Charles Drazin, Kristin Ross, Ginette Vincendeau, to name but a few. Also, the major biographies of key directors do tackle parts of this theme. However, there has been a glossing over of many of the films and film events that are explored in my work. For example, the riots mounted against Battle of Algiers or The Last Temptation of Christ don’t really get discussed that much elsewhere. The idea that cinema in Paris was part of a complex constitution of nationalist politics just doesn’t fit how film studies tends to work at the moment. It doesn’t fit into the popular research questions of the last five or six years. As a footnote: I will also say I was a little surprised how through the early 2000s so many scholars were interested in transnationalism, when it seemed to me that the nationalistic aspects of cinema in France were only really addressed in relatively few works. I wanted to return to the national frame and suggest that there was still more to gain from improving our understanding of that. As I say in the book itself, this is not an either or question. For me the more we learn about different facets of a research area the more interesting it becomes. So at least I hope my findings are able to generate some debate, even if they don’t change how people think. What role does culture and cinema play in the world of Le Pen and the Front National? Dotted through the book and at some length in its final chapter I explore the role of extreme right-wing intellectuals who have been influential in linking nationalism to the cinema, and vice versa. The book adds to our understanding of the successes of the nationalist far right in France in I think two main ways. (1) It raises for discussion the banal nationalism of post-war life, neither the unique preserve of right nor left. In so doing, readers will be able to judge if it is this environment that provides a safe context for the perpetuation of xenophobic politics; (2) also, it details the relatively small but nevertheless influential world of right-wing cultural commentators, sympathizers and one or two filmmakers. These people may or may not have ever voted for the Front National. However, what they did establish was a political theatre where similar values were accepted as being normal and in public circulation. (This should not be a surprise as we see similar activity in the literary field, as well as in other corners of popular culture that I am interested in, for example in comics.) For me it is these two aspects that make the extreme right wing ideology possible and prominent in post-war France. Of course they are not the only, or even the best explanations, of what we are discussing here. But they are an important cultural or subcultural factor in the longevity and penetration of the FN. Hugo Frey is Head of Department and Reader in History at the University of Chichester. He is the author of Louis Malle (Manchester University Press, 2004) in the ‘French Film Directors’ Series. His research on French history, politics, cinema and popular culture has been published in journals including Yale French Studies, Modern and Contemporary France, South Central Review and Journal of European Studies.